This issue of 2000 AD, the ninth, has a great cover. It is a cyborg with a red sniper rifle, with his sights on one of the Harlem Heroes. It looks great: the rifle in particular, with a handle forward and gas return pipes, looks very convincing without being a copy of a contemporary design. I write a lot about 2000 AD, it was a very formative experience for me, and I still read it today. I have a 2000 AD page where I link to all the issues I have talked about on this site.This issue came out 23 April 1977, a very long time ago and was being sold for the astoundingly low price of just 8p. 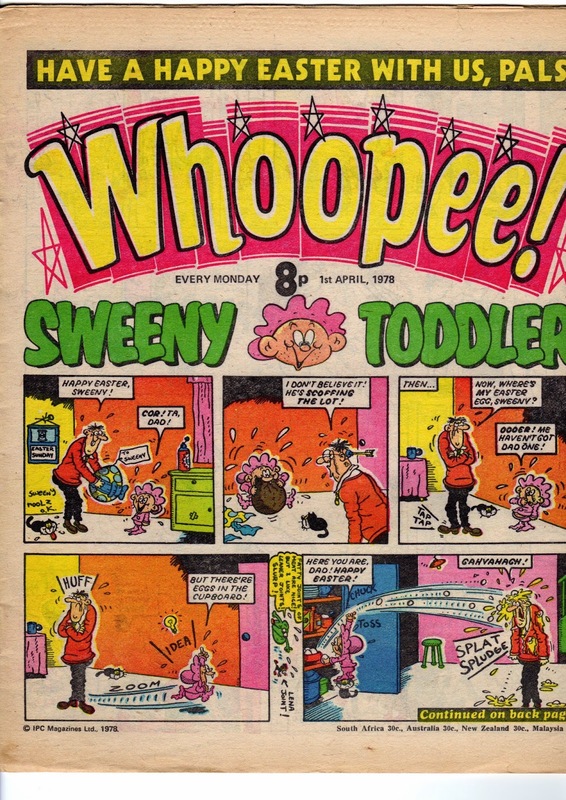 I remember that when my Gran bought comic books for me (usually humor like Whoopee), she used to complain that 8p was expensive, and also new money - from her point of view the UK currency had recently been decimalized, and a comic book in her mind should have cost nearer to 2p. I guess this ancient comic book only looks cheap from my present point of view. The first story this issue is Invasion. Which is usually as dumb as a box of hair. This week is no exception, because our small team of resistance fighters, led by a lorry driver, get it into their head that they can sink an enemy aircraft carrier. They come up with a plan involving limpet mines and divers, but it doesn't work. Luckily the lorry driver has a plan B. He swings onto the carrier with a shotgun, spills a bunch of oil barrels and takes the giant ship out in a giant explosion. It's completely nuts, but I must admit I was entertained by it, heaven help me. maybe my brain is turning to mush. Bill Savage also uses a couple of popular phrases of the time: Hello Sailor, and Frying Tonight. Next comes Flesh, the time traveling dinosaur hunters story, and one of my favorites. This was from a time before we knew some dinosaurs were covered in feathers, so we get only delightful, big, fat, tail-dragging, scaly, behemoths, as dinosaurs should be. This week has the great addition of a train, and instead of a cattle catcher on the front, it has a dinopuncher. Just another reminder that this story is very much a Western. We also see some 70s parenting, with a father smacking his snot-nose kid upside the head. As always, the dinosaurs get through puny human defenses and start causing chaos. I particularly liked it when the snit-nise kid gets eaten. 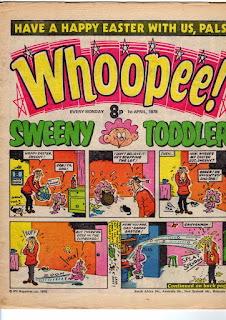 There is a censored box, as the usually bloodthirsty 2000 AD shies away from showing the detail of the child's demise. It made me smile. Then comes the first page of Harlem Heroes, and it is impressive. It shows a mummy-like cyborg called Gruber hopping up from a surgeons table and smashing his way out of the lab. It is all beautifully detailed work. There is a glimpse of the team's bus seen from above, from the flat roof of a Harlem building, that is impressive, even though it's just a small panel on a busy page. I do like the crazy, cruise-ship like design of the bus. Then we are off to South America, and things get stereotypical and bonkers pretty quickly. The enemy team are called Montezuma's Mashers and their stadium is a step pyramid. Conveniently the local fans wear metal masks, and this helps the homicidal cyborg blend in with the crowd. In its own terrible, cultural appropriating away, its actually a half-way interesting attempt at world building, and the art really sells it. Dan Dare is next and we are still within the confused environs of a bioship, but Belardinelli has a lot of fun drawing the writhing, pulsing, and undulating surroundings. 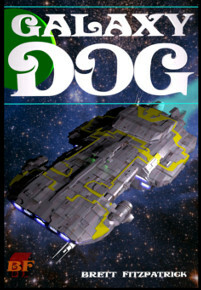 Then Dan uses the drives of his spaceship as a weapon, which is a big trope in Sci-Fi. It is one of the problems with the new Star Wars movie, where a spaceship goes to warp and cuts another in half. If that is possible, it should be happening a lot more. This sort of inconsistency is much more forgivable in a comic book, of course especially one from 1977, but it still irks. The Biogs get angry and suddenly giant battle fleets from both Earth and wherever the Biogs originated arrive, and Dan is caught in the middle, in a severely damaged spaceship. That's your cliffhanger folks. Next comes a range of Batman toys from a company called Corgi, that I remember as being excellent. I owned the Batmobile and the Batboat from this range and got hours of play from them, before they inevitably disintegrated and were lost. None of my toys have survived from childhood as mint in box, but these were played with to the point of absolute destruction. I had forgotten about the "quick release slasher blade" until reading this advert, but memories of its spring-loaded charms came flooding back. I had also forgotten that the batboat comes with a trailer. I must have wanted it, instead of the cooler helicopter, to go on the back of my batmobile. Next comes MACH 1, about a super-spy with powers from... acupuncture. He has, once again been sent to an unstable country. As usual, he murders his way to his objective, causing huge amounts of damage as he goes. This guy is not Superman and is never held back by even the slightest hint of a moral code or sense of right and wrong. His objective this week is a nuclear scientists who can not be allowed to work for the new government, as that will inevitably lead to World War III. The whole thing is ludicrous: for example, our hero drives two jeeps at the same time in a head on attack on some tanks. Judge Dredd is next, and it is not drawn by one of the usual team. In this issue, Dredd looks a lot more shiny and futuristic even than the art of Ron Smith. The episode starts with a salesman demonstrating how obedient their new line of robots is by ordering one to walk into an incinerator. The robot cries as it dies, and the salesman is proud that the machine thinks and feels but obeys. It's a story that shows both the criminal and Judge Dredd being helped by robots, and is quite a thoughtful take on AI, surprisingly.